The Taos Economic Reports that were done for the Taos County Chamber of Commerce and are listed on this page have become difficult to create on a timely manner due to the reporting of economic data by State and other agencies. To make economic data available to our Members and the community we have compiled some interesting reports and links. These reports and links are based on the same basic information from Bureau of Business and Economic Research at the University of New Mexico (BBER) as our reports prior to and including the 2nd Quarter 2014. 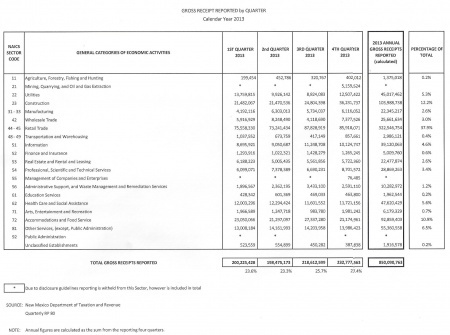 Here is the GRT report for the 3rd & 4th Quarter of 2014. This is the latest data released by the State of New Mexico. Personal Income by Major Component Personal income is the before-tax income received by people from all sources and is calculated as the sum of net earnings by place of residence, property income, and personal current transfer receipts (transfer payments). Net earnings is earnings by place of work - the sum of wages and salaries, supplements to wages and salaries, and proprietors’ income - less contributions for government social insurance, plus an adjustment to convert earnings by place of work to a place-of-residence basis. The line chart above shows the growth in per capita income in New Mexico and the U.S. from 2000 to 2014. 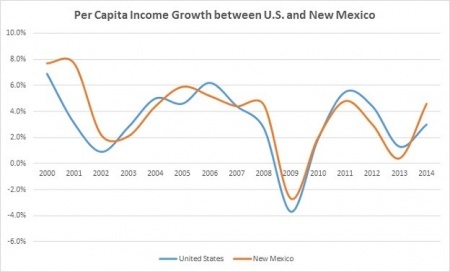 New Mexico’s per capita personal income in 2000 grew by about 8% and the growth decelerated till 2009 where it declined to a negative growth rate of 2.7%. It has peaked since then reaching a growth rate of 4.6% in 2014, a growth rate faster than the national average growth rate. In 2014 New Mexico’s per capita income of $37,605 grew by 4.6% compared to 2013, ranking New Mexico third in the nation for per capita personal income growth. The U.S. average per capita personal income grew by 3% in 2014. These 2009-2013 reports were generated by The American Community Survey (ACS). ACS is an ongoing survey that provides vital information on a yearly basis about our nation and its people. Information from the survey generates data that help determine how more than $400 billion in federal and state funds are distributed each year. Through the ACS, we know more about jobs and occupations, educational attainment, veterans, whether people own or rent their home, and other topics. Public officials, planners, and entrepreneurs use this information to assess the past and plan the future. When you respond to the ACS, you are doing your part to help your community plan hospitals and schools, support school lunch programs, improve emergency services, build bridges, and inform businesses looking to add jobs and expand to new markets, and more.